The goal of the regional climate modelling activity is to study regional physical phenomena not represented in state-of-the-art global climate models because of their too low spatial resolution (typically 100km) and to study these processes at climate time scales (intraseasonal, interannual and decadal variability, trend, climate change), that are not affordable by very high-resolution process-oriented models (MesoNH, AROME, …). Regional climate modelling then requires both long-term simulations and high-spatial resolution. In the frame of the climate group at CNRM, I’m using three Regional Climate Models (RCMs) all developed in-house : the tilted and stretched-grid version of ARPEGE-Climate, the Limited Area Models (LAM) ALADIN-Climate and the convection-permitting regional climate model AROME-Climate. ARPEGE-Climate is a global and spectral AGCM allowing a resolution of 10-50 km over the area of interest in using its zoom capability. It can also be considered as a two-way nested RCM. In contrary, ALADIN-Climate is forced at its lateral boundaries either by ECWMF products (ERA40, ERA-Interim, ERA5, ECMWF analysis) or by any version of ARPEGE-Climate. Up-to-now ALADIN-Climate was used at 150, 50, 25 and 12 km resolution. Using reanalysis-driven simulations such ARPEGE-Climate with spectral nudging (also called ARPERA, Herrmann and Somot 2008, Herrmann et al. 2010) or ALADIN-Climate with lateral nudging and spectral nudging (also called ALDERA, Hamon et al. 2016) we developed “poor-man regional reanalysis” or “regional hindcast” in order to obtain physically-consistent high-resolution meteorological fields following the real chronology over a long period of time (typically 1958-2013 for ARPERA and 1979-2013 for ALDERA). These regional hindcast simulations are very useful for model physics/configuration evaluation (Herrmann et al. 2011, Sevault et al. 2014, Nabat et al. 2015a), past case studies (Herrmann and Somot 2008, Herrmann et al. 2010, Waldman et al. 2017ab) and past climate variability studies (Josey et al. 2011, L’Hévéder et al. 2013, Nabat et al. 2014, Somot et al. 2016) and can be used to replace observations if missing, for example to drive regional ocean models (Beuvier et al. 2010, Herrmann et al. 2010, Waldman et al. 2018). Using that numerical tools, my research activities focus on the Euro-Mediterranean area. I study the regional climate variability but also some specific regional physical phenomena such as Mediterranean cyclogenesis (Somot 2005), regional winds (Herrmann et al. 2011), heavy precipitation events (Beauland et al. 2011), Mediterranean strong air-sea fluxes (Herrmann and Somot 2008, Papadopoulos et al. 2012, Somot et al. 2016) as well as open-ocean deep convection, water mass formation and Mediterranean thermohaline circulation (Somot et al. 2006, 2016). I also focus on the Mediterranean Sea Water and Heat Budgets concerning the estimations of the various terms and the model evaluation (Sanchez-Gomez et al. 2009, Elguindi et al. 2010, Sanchez-Gomez et al. 2011, Dubois et al. 2012, Soto-Navarro et al. 2014, Sevault et al. 2014, Nabat et al. 2014, 2015a). My scientific interests include also methodology studies dealing with the main qualities and drawbacks of the Regional Climate Models (Sanchez-Gomez et al. 2008, Radu et al. 2008, Colin et al. 2010, Sanchez-Gomez and Somot 2016) as well as all kind of studies related to the understanding of Mediterranean climate variability and change. 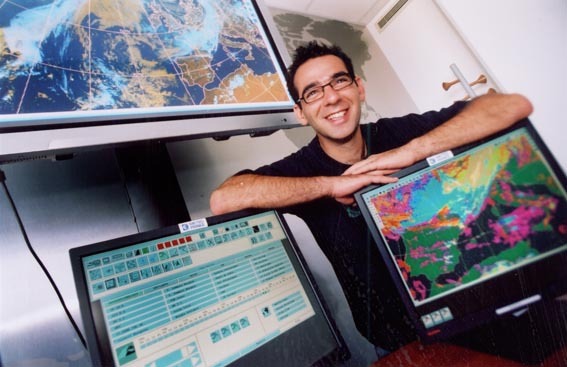 The Mediterranean basin is a good case-study for regional climate modelling. It is indeed surrounded by various and complex topography channelling regional winds (Mistral, Tramontane, Bora, Meltem, Sirocco) that define local climates. Many small-size islands limits the low-level air masses and its coastline is particularly complex. These geographical characteristics require high-resolution climate modelling. What is true for the Mediterranean climate is also true for the Mediterranean Sea (complex coastlines, islands, narrow and shallow straits). To correctly represent the Mediterranean Sea, we need ocean models with at least a 10 km resolution. In the frame of the climate group at CNRM, we develop and use different regional Mediterranean versions of the global ocean NEMO code : OPAMED8 (Somot et al. 2006), NEMOMED8 (9 to 12 km spatial resolution and 43 vertical levels, Beuvier et al. 2010), NEMOMED12 (6 to 7 km spatial resolution and 75 vertical levels, Beuvier et al. 2012, Waldman et al. 2017a) and more recently an AGRIF zoom within NEMOMED12 for the North-Western Mediterranean Sea (2 to 2.5 km spatial resolution, Waldman et al. 2017b). For a long time, the Mediterranean Sea has been considered as a laboratory of the global ocean as it shows (close to the European coast) many key and interesting ocean physical processes and, among them, the open-sea deep convection that usually stands in the Greenland, the Labrador and the Weddell Seas. The Mediterranean areas of deep convection (Gulf of Lions, South Adriatic, Rhodes Gyre and the Cretan Sea) lead to an anti-estuarine thermohaline circulation with 3 main layers : a surface layer with the Atlantic Water (AW, warm and fresh) that flows into the Mediterranean Sea through the Strait of Gibraltar, an intermediate layer with the Levantine Intermediate Water (LIW, relatively warm and very salty) and a deep one with the different cold and salty water masses (WMDW, AdDW, EMDW, CDW). The ocean deep convection, the deep water formation and the MTHC are well-adapted processes for regional climate modelling tools. Indeed, their modelling requires high spatial air-sea fluxes, fine representation of the Mediterranean Sea and they show strong interannual to decadal variability and long-term trends. Moreover the MTHC can influence the surrounding climate in modulating the local SST. It has also an impact on the Atlantic Ocean through the Mediterranean Outflow Waters that flow into the Atlantic at about 1000 m and are considered as a source of salt and heat for the Atlantic Ocean. The study of the Mediterranean Sea, of the high-resolution air-sea fluxes, of the open-sea deep convection, the deep water mass formation and of the Mediterranean Thermohaline Circulation, its regional climate influence and its climate-scale variability are among my main research interests (Somot et al. 2006, Herrmann and Somot 2008, Herrmann et al. 2008a, 2008b, 2010, Beuvier et al. 2010, Josey et al. 2011, Herrmann et al. 2011, Beuvier et al. 2012, L’Hévéder et al. 2013, Durrieu de Madron et al. 2013, Somot et al. 2016, Waldman et al. 2016, 2017a, 2017b, 2018). Another interesting Mediterranean phenomenon is the cyclogenesis. The Gulf of Genoa is one of the major cyclogenesis area of the Northern Hemisphere. The cyclones are formed in the lee side of the main orography anomalies of the Mediterranean basin such as the Alps, the Apennins or the Atlas Mountains. The Mediterranean cyclones are sub-synoptic systems, smaller and with a shorter life-time than their Atlantic cousins. Their specific scales, their orography-induced genesis and their ability to produce intense precipitation events require to use regional climate numerical tools to study their interannual variability and their possible evolution under the climate change. The Mediterranean cyclogenesis was one of my first scientific topic (see my PhD) but my scientific interest slowly moved towards one of the related phenomena : the Mediterranean Heavy Precipitation Events (HPE) that can reached few 100 mm/day precipitations in the South-East of France and in many other countries around the Mediterranean basin. The better way of modelling such events, their interannual variability, and their possible evolution during the 21st century constitute now one of my main research topics thanks to the CYPRIM, MEDUP, REMEMBER and EUCP projects in the frame of the HyMeX programmes (Déqué and Somot 2008, Ricard et al. 2009, Colin et al. 2010). Hybrid downscaling techniques mixing dynamical and statistical methods and using very high resolution non-hydrostatic models were developed in collaboration with the CNRM meso-scale research group (Beauland et al. 2011). The impact of the high frequency ocean-atmosphere coupling on these intense events is also studied (Berthou et al. 2016). Concerning the study of the HPE, the new "frontier" modelling tool currently under development is the climate version of the non-hydrostatic and convection-permitting AROME model (Coppola et al. submitted, Fumière et al. submitted). The cyclogenesis, the intense precipitation, the open-sea deep convection and the Mediterranean thermohaline circulation have at least one common point. These phenomena strongly depend on the high-resolution air-sea interactions. Moreover it has been demonstrated that the deep convection occur following cyclone-induced winds and strong air-sea fluxes. The large heat and water losses induced by the Mediterranean cyclones and winds enhance the deep convection. Besides the ocean mixed layer depth drives the Mediterranean heat content and then its capacity to release water and energy to feed Mediterranean cyclones and intense precipitation events. It is therefore logical to study these processes through an air-sea coupled approach using high-resolution Atmosphere-Ocean Regional Climate Model (AORCM). This scientific topic started during my PhD defended in December 2005. Since 2002, we developed at CNRM various Mediterranean-dedicated AORCMs first coupling the stretched ARPEGE-Climate with OPAMED8 (Somot et al. 2008, Dubois et al. 2012) then the LAM ALADIN-Climate with NEMOMED8 (Herrmann et al. 2011) using the OASIS coupler developed at CERFACS. More recently, we enlarged our primary regional ocean-atmosphere approach by integrating other components of the regional climate system to obtain fully coupled Mediterranean-dedicated Regional Climate System Models (RCSM). In the frame of the HyMeX and Med-CORDEX programmes, we developed the 4th generation of the CNRM Regional Climate System Model (CNRM-RCSM4, Sevault et al. 2014, Nabat et al. 2014, Nabat et al. 2015a). It includes the regional representation of all the physical components of the regional climate system that is to say, the atmosphere (ALADIN, 50km), the land surface and hydrology (ISBA, 50 km), the rivers (TRIP, 50 km), the ocean (NEMOMED8, 10 km) and recently the aerosols (50 km). With these numerical tools, we studied the above-mentioned physical phenomena as well as their interannual to decadal variability. Differences between non-coupled and coupled models have been identified and understood in the mean behaviour as well as in the interannual variability of some of these phenomena. CNRM-RCSM4 also allows to produce consistent regional climate change scenarios for the Mediterranean climate and the Mediterranean Sea. The possible evolution of the Mediterranean cyclogenesis, the heavy precipitation events, the ocean deep convection, the deep water mass formation and the Mediterranean thermohaline circulation during the 21st century can then be simulated following various IPCC climate change hypothesis (RCP2.6, RCP4.5 and RCP8.5). Today, all the institutes developing Mediterranean RCSMs are coordinated in the Med-CORDEX initiative (www.medcordex.eu, Ruti et al., 2016). List of the programmes and projects in which I have collaborated or I collaborate. Waldman R., Somot S., Herrmann M., Testor P., Estournel C., Sevault F., Prieur L., Mortier L., Coppola L., Taillandier V., Conan P., Dausse D. (2016) Estimating dense water volume and its evolution for the year 2012-2013 in the North-western Mediterranean Sea : an Observing System Simulation Experiment approach. JGR-Oceans, 121(9), 6696-6716, doi : 10.1002/2016JC011694, Special Issue HyMeX-MerMex. Adloff F., Somot S., Sevault F., Jordà G., Aznar R., Déqué M., Herrmann M., Marcos M., Dubois C., Padorno E., Alvarez-Fanjul E., Gomis D. (2015) Mediterranean Sea response to climate change in an ensemble of twenty first century scenarios. Climate Dynamics, 45 (9), 2775-2802, doi:10.1007/s00382-015-2507-3. Gualdi S., S. Somot, W. May, S. Castellari, M. Déqué, M. Adani, V. Artale, A. Bellucci, J. S. Breitgand, A. Carillo, R. Cornes, A. Dell’Aquila, C. Dubois, D. Efthymiadis, A. Elizalde, L. Gimeno, C. M. Goodess, A. Harzallah, S. O. Krichak, F. G. Kuglitsch, G. C. Leckebusch, B. L’Heveder, L. Li, P. Lionello, J. Luterbacher, A. Mariotti, A. Navarra, R. Nieto, K. M. Nissen, P. Oddo, P. Ruti, A. Sanna, G. Sannino, E. Scoccimarro, F. Sevault, M. V. Struglia, A. Toreti, U. Ulbrich and E. Xoplaki (2013b) Future Climate Projections, In : Regional Assessment of Climate Change in the Mediterranean, Volume 1. Eds. Navarra, A., and L. Tubiana, Springer, Dordrecht, The Netherlands, 53-118. Sofianos S., V. Vervatis, N. Skliris, S. Somot, A. Lascaratos and A. Mantziafou (2013), Climate variability and water mass formation in the eastern Mediterranean Sea, Springer Atmospheric Sciences, Advances in Meteorology, Climatology and Atmospheric Physics, Part 2, pages 729-735, doi : 10.1007/978-3-642-29172-2. Nabat, P., Solmon, F., Mallet, M., Kok, J. F., and Somot, S (2012) : Dust emission size distribution impact on aerosol budget and radiative forcing over the Mediterranean region : a regional climate model approach, Atmos. Chem. Phys., 12, 10545-10567, doi:10.5194/acp-12-10545-2012, 2012. Solé J., Ruiz S., Pascual A., Somot S., Tintoré J. (2012) Ocean color response to wind forcing in the Alboran Sea : a new forecasting method. J. Mar. Syst. Vol 98-99:1-8. Doi : 10.1016/j.jmarsys.2012.02.007. Dubois C., S. Somot, S. Calmanti, A. Carillo, M. Déqué, A. Dell’Aquilla, A. Elizalde-Arellano, S. Gualdi, D. Jacob, B. Lheveder, L.Li, P. Oddo, G. Sannino, E. Scoccimarro, F. Sevault (2012) Future projections of the surface heat and water budgets of the Mediterranean sea in an ensemble of coupled atmosphere-ocean regional climate models, Clim. Dyn. 39 (7-8):1859-1884. DOI 10.1007/s00382-011-1261-4. Tsimplis M.N., F. Raicich, L. Fenoglio-Marc, A. G.P. Shaw, M. Marcos, S. Somot and A. Bergamasco (2012) Recent developments in understanding sea level rise at the Adriatic coasts. Physics and Chemistry of the Earth. Vol. 40-41, page 59-71. Josey, S. A., S. Somot, and M. Tsimplis (2011), Impacts of atmospheric modes of variability on Mediterranean Sea surface heat exchange, J. Geophys. Res., 116, C02032, doi:10.1029/2010JC006685. Beaulant A.-L., Joly B., Nuissier O., Somot S., Ducrocq V., Joly A., Sevault F., Déqué M., Ricard D. (2011) Statistico-dynamical downscaling for Mediterranean heavy precipitation, QJRMS, doi : 10.1002/qj.796, available online. Herrmann M., Sevault F., Beuvier J., Somot S. (2010) What induced the exceptional 2005 convection event in the Northwestern Mediterranean basin ? Answers from a modeling study. Beuvier J., F. Sevault, M. Herrmann, H. Kontoyiannis, W. Ludwig, M. Rixen, E. Stanev, K. Béranger, S. Somot (2010) Modelling the Mediterranean Sea interannual variability over the last 40 years : focus on the EMT, JGR-Ocean, 115, C08017, doi:10.1029/2009JC005950. Ricard D., Beaulant A.L., Boé J., Déqué D., Ducrocq V., Joly A., Joly B., Martin E., Nuissier O., Quintana Seguí P., Ribes A., Sevault F., Somot S. (2009) Impact du changement climatique sur les événements de pluie intense du bassin Méditerranéen. La Météorologie, Projet CYPRIM, Partie II, n.67, Nov.2009, page 19-30. Somot S. (2005) Modélisation climatique du bassin méditerranéen : variabilité et scénarios de changement climatique. Ph-D thesis. Université Paul Sabatier, Toulouse. Beuvier J, C. Lebeaupin Brossier, K. Béranger, T. Arsouze, R. Bourdallé-Badie, C. Deltel, Y. Drillet, P. Drobinski, N. Ferry, F. Lyard, F. Sevault and S. Somot (2012) MED12, oceanic component for the modeling of the regional Mediterranean earth system, Mercator Ocean Quaterly Newsletter #46, Special Issue NEMO-MyOcean, Novembre 2012. Sanchez-Gomez E., Somot S. (2010) Study of the Mediterranean Sea Water and Heat budgets simulated by an ensemble of high resolution Regional Climate Models. Note de centre n°112. Groupe de Météorologie de Grande Echelle et Climat. CNRM. Janvier 2010. Hallegatte S., S. Somot, and H. Nassopoulos, 2008. Anticiper le Changement Climatique autour de la Méditerrannée, Institut de Prospective Economique du Monde Méditerranéen, 76pp. Martin, E., Ducrocq, V., Joly, A., Joly, B., Nuissier, O., Quintana-Segui, P., Ricard, D., Sevault, F., Somot, S., Drobinski, P. (2007) La Méditerranée, région témoin : de CYPRIM à HyMEx / The Mediterranean area : projects CYPRIM and HyMEx. Proceedings (8 pages) Congrès SHF - 29ème journée de l’hydraulique : "Variations climatiques et hydrologie", Lyon, 27-28 mars 2007. La Houille Blanche, n°6/2007, 90-96. Li L., A. Bozec, S. Somot (2006) Modelling regional-scale climate change of the Mediterranean. Contribution to CLIVAR newsletter EXCHANGES. Somot S., Sevault F., Nabat P., Dubois C., Kiki (2016) How can high-resolution representation of the regional seas and aerosols modify regional climate change ? A fully-coupled regional climate system approach to question current CORDEX experimental protocol. International Conference on Regional Climate – CORDEX 2016, Stockholm, May 2016, Invited speaker. Somot S. (2014) Status of the Med-CORDEX initiative. The HyMeX Regional Climate Modelling Science Team (former TTM3). 3rd international Med-CORDEX workshop, Palaiseau (France), 26-28 May 2014 (solicited talk). Somot S., Ruti P. and the MedCORDEX team (2013) The Med-CORDEX initiative : first use of very high resolution RCMs and fully-coupled multi-component Regional Climate System Models to assess climate variability and change in the Mediterranean. International conference on Regional Climate – CORDEX 2013, Brussels, November 2013, Sollicited speaker. Somot S. (2013) Characteristics of the NW Mediterranean Sea from Sept 2012 to March 2013 (SOP1 and SOP2). HyMeX SOPs’ Debriefing workshop (April 2013, Toulouse). Oral (invited). Somot S. (2012) CORDEX : The Coordinated Regional Downscaling Experiment : background, status and perspectives. Workshop MISSTERRE-CORDEX, Nov 2012, Paris (keynote speaker). Somot S. (2012) « HyMeX-TTM3 : Regional Climate Modelling ». HyMeX-TTM3 and MedCORDEX workshop, Toulouse, April 2012 (solicited talk). Air-sea fluxes, open-sea deep convection and cyclogenesis are studied in the Mediterranean with the development of a regional coupled model (AORCM). It accurately simulates these processes and their climate variabilities are quantified and studied. The regional coupling shows a significant impact on the number of winter intense cyclogenesis as well as on associated air-sea fluxes and precipitation. A lower interannual variability than in non-coupled models is simulated for fluxes and deep convection. The feedbacks driving this variability are understood. The climate change response is then analysed for the 21st century with the non-coupled models : cyclogenesis decreases, associated precipitation increases in spring and autumn and decreases in summer. Moreover, a warming and salting of the Mediterranean as well as a strong weakening of its thermohaline circulation occur. This study also concludes with the necessity of using AORCMs to assess climate change impacts on the Mediterranean. Les flux air-mer, la convection profonde et la cyclogénèse sont étudiés en Méditerranée grâce au développement d’un modèle régional couplé (AORCM). Il reproduit correctement ces processus et permet de quantifier et d’étudier leur variabilité climatique. Le couplage régional a un impact significatif sur le nombre de cyclogénèses intenses en hiver et sur les flux et précipitations associés. Il simule une variabilité interannuelle plus faible qu’en mode forcé pour les flux et la convection et permet de comprendre les rétroactions qui la pilotent. L’impact régional d’un scénario climatique est analysé avec les modèles non-couplés : le nombre de cyclogénèses diminue, les pluies associées augmentent au printemps et en automne et diminuent en été. En outre, la Méditerranée se réchauffe, se sale et sa circulation thermohaline s’affaiblit fortement. Cette thèse conclut de plus à la nécessité des AORCMs pour étudier l’impact du changement climatique en Méditerranée.